We are on a high at State of Place with exciting prospects in the Steel City - Pittsburgh! Our City of Tomorrow Pittsburgh proposal was selected as a semi-finalist advancing to the next stage (big thank you for your support last week! ), and our team just rolled into this amazing city to attend the Rail~volution conference! Not only are we excited for CTO Andy Likuski to pitch the value of data-driven citymaking in a “Shark Tank” setting but he’s also speaking on an “Empathy and Planning” panel that tackles how city planners should “walk in the shoes” of our community members and other stakeholders in need of livable places (and of course how that’s embedded at the core of our smart data!). For those of you lucky enough to attend the conference, you get a State of Place 2-for-1 as Kelliann Beavers (Operations Manager/Urban Data Geeks Lab Director) will also be around to “talk data geek shop!” So without further ado, here’s Andy’s take on Rail~volution! 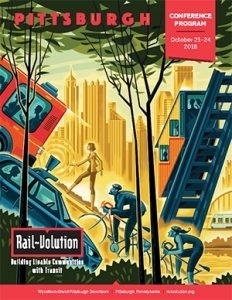 If you haven’t been to a Rail~volution conference, yet, roll on over now to Pittsburgh, PA (it’s on October 21st-24th)! Don’t worry, this isn’t your father’s urban planning conference, full of sleepy sessions about ABC Town’s new plan for Main Street. Rail~volution is hip—there’s always an evening PechuKucha event with beer and lots of hooting and hollering—but it also slices through the mundane and gets to issues that really matter. The conference focuses on transit, livability, and community, which is the stuff that impacts everyone’s lives in a big way, and it’s the core motivation for what we do at State of Place. I’m so thrilled to announce that I will be participating in two sessions at Rail~volution. On Monday I’ll be pitching State of Place in a Shark Tank, competing with four other great companies for a shot at the finals on Wednesday. I’ll be telling the judges all about State of Place in a blazing 5 minutes followed by 15 minutes of questions, and I’ll also tie in the conference themes of Equity, Inclusivity, Representation, and the interplay of Land Use & Transportation. To top it off, I’ll preview some new product features that we’ve got in the forge, so don’t let your coffee break run over time while I go on my feeding frenzy! The changing Coliseum neighborhood of Oakland, CA, where representation of everyone is crucial. The second event is a panel discussion on Tuesday about Empathy in Planning. And as the guy with the software product on the panel, there will surely be some juicy debate about the role of technology in planning, and whether we can indeed be empathetic to all stakeholders during the planning process. Now I’m hardly the kind of guy that thinks technology solves all problems. I believe in a wide variety of urban solutions that are 200 to 2000 years old! But I also know that the current planning process is not serving the most vulnerable, and in fact leads to bad results for almost everyone. I will argue that State of Place is a platform that objectively quantifies the value of urban design. Whats more, we’re building software that will give everyone a voice and a way to promote their own ideas with numbers to back it up. I expect to “agree to disagree” ;) with a lot of what’s said during the panel, and to be challenged by some very bright minds. I just rolled into beautiful Pittsburgh from Oslo (via NYC :) on the Amtrak Pennsylvanian on Saturday. It’s my first time here and my geeky planner heart has been thumping with excitement for weeks. My plan is to bike share it across the rivers, ride the light rail and spectacular Duquesne and Monongahele Inclines, but mostly I’ll be enjoying the autumn colors on the streets and making hundreds of new friends at Rail~volution. My State of Place partner in “creating great places people love” Kelliann Beavers and I will be at Rail~volution all week. As you’re being inspired by great conference events, come talk to us and find out how State of Place can improve your city’s transit, livability, and community. And don’t miss my sessions! Looking forward to riding some bikes and steel rails together in Pittsburgh! Be sure to email Kelliann (kelliann@stateofplace.co) or me at (andy@stateofplace.co) to grab a bike, coffee or have a quick chat. For those of you who aren’t able to attend, don’t worry! Whether you are from Pittsburgh, Portland, Paris or any city looking to innovate, look no further! Transform your city with smart data to become more livable, walkable and safer by either scheduling a time to demo the software or simply try it for free now! Older PostHelp Us Help You Get to Zero!